The Colorado Rockies defeated the San Francisco Giants 9-8 in thrilling fashion Monday afternoon in the first game of the club’s 10-game homestand. 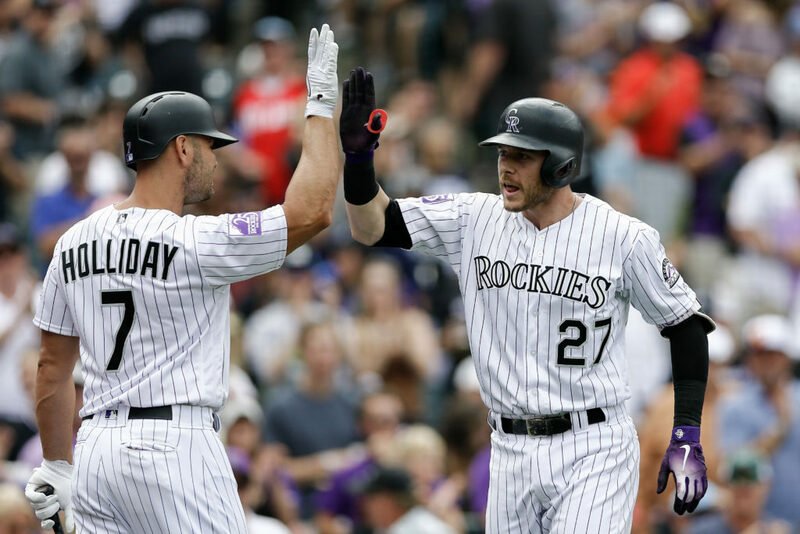 The Rockies entered the game two games above .500 in a tight race for first place in the National League West and came away with a crucial comeback victory Monday to keep pace. The Rockies initially jumped out to an early lead in the first inning, starting with a Charlie Blackmon leadoff single to center field. DJ LeMahieu followed by belting a two-run home run to center field to give Colorado an early 2-0 lead. The Rockies’ offense stayed hot, as Nolan Arenado hit a double to left field, which was then followed by a two-run home run from Trevor Story to put the Rockies up 4-0. The Giants got a run back in the 3rd inning when Gorkys Hernandez hit a solo home run to left field. San Francisco manufactured an additional run in the fourth inning which started with a double from Chase d’Arnaud. Evan Longoria later hit a sacrifice fly that scored d’Arnaud, making the score 4-2. Colorado added to its lead in the fifth inning. Blackmon was beaned in the Rockies’ first at bat of the inning. Nolan Arenado then grounded into a fielder’s choice; however, due to an error by Giants’ second basemen Kelby Tomlinson both Blackmon and Arenado reached base safely. Trevor Story then hit his second home run of the ballgame, a three-run blast to left field to give the Rockies a 7-2 lead. The Giants answered again in the sixth inning where All-Star Brandon Crawford hit an RBI single to score former Rockies catcher Nick Hundley, who reached base via a ground rule double. San Francisco kept things going into the seventh inning where they were able to get two runners on the base paths. With two outs, Longoria hit a triple to deep right field, scoring two runs to bring the Giants within two runs of the Rockies. San Francisco’s’ momentum rolled over into the eighth inning where they managed to take the lead. Seung-hwang Oh was tasked to pitch the eighth inning for the Rockies where he quickly retired the first two batters he faced. Oh then proceeded to hit Hernandez with a pitch before the Giants opted to pinch hit Allen Hanson in place of Tomlinson. Hanson hit a two-run home run to right field to tie the game at seven runs apiece. The Giants then pinch hit Chirs Shaw in place of the pitcher and he mimicked Hanson by hitting a solo home run to right field, giving the Giants an 8-7 lead. With their backs against the wall, the Rockies refused to quit and rallied in the bottom of the eighth inning. Ian Desmond started the inning with a single to left field. Rockies’ skipper Bud Black opted to pinch hit Chris Iannetta in place of fellow catcher Drew Butera. Iannetta delivered with a double to right field, giving the Rockies two base runners. Black used another pinch hitter, this time youngster Noel Cuevas. Doubling down on the bench, Cuevas delivered for Black and the Rockies by hitting a single to center field, scoring two runs to give the Rockies a 9-8 lead. Wade Davis then set the Giants down in order in the ninth inning to solidify the victory for Colorado. Colorado’s late-game tenacity has been a common theme throughout the second half of the summer with Monday’s holiday victory serving as another electrifying victory. The Rockies current 10-game homestand includes series against the Giants, Los Angeles Dodgers, and Arizona Diamondbacks and is critical to their continued pursuit for the postseason. The Rockies and Giants will continue their series Tuesday night at Coors Field with first pitch set for 6:40 MST.